GUNG CHUP PAENG TORD Golden Deep-fried king prawn in batter and onion rings served with sweet chili sauce. Sweet corn cake served with sweet chilli sauce. SELECTION OF: minced pork, minced chicken, minced beef. Typical Muslim dish in mile spicy coconut milk sauce with potatoes, and onions. 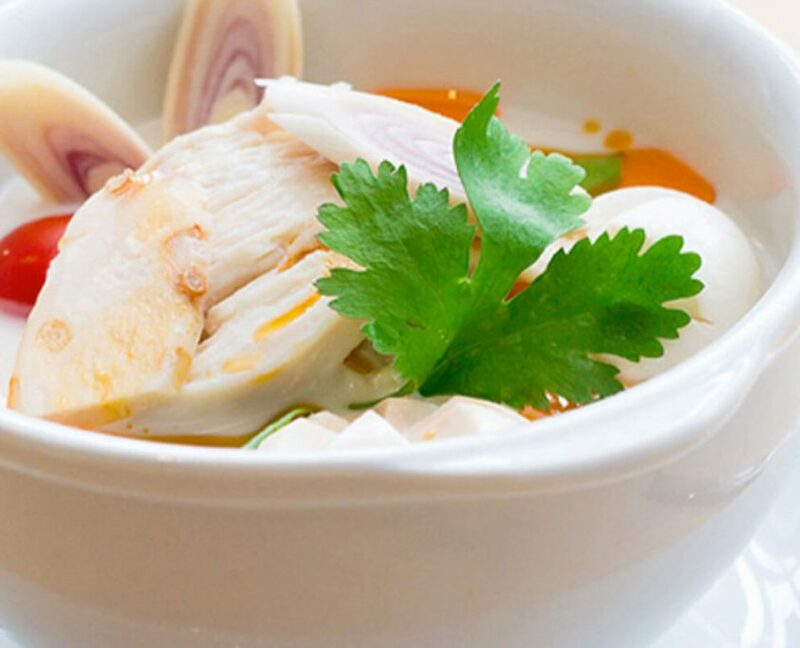 Authentic Thai soup seasoned with cream, kaffir lime leaves, lemon grass, chilies, galangal roots, and chili oil. With Thai chili, onions, mushroom, and peppers. Stir-fried ginger with spring onions, mushrooms, and peppers. Stir-fried with spring onions, peppers, cashew nuts, and pineapple in red wine sauce. Stir-fried with mushrooms, onions, spring onions, peppers, and carrots in oyster sauce. Stir-fried cashew nuts with mushrooms, onions, spring onions, peppers, and carrots. Stir-fried chili oil with mixed vegetables. Stir-fried sweet and sour sauce with cucumber, pineapple, onions, spring onions, and tomatoes. Stir-fried garlic with vegetable, white pepper, and carrots. Stir-fried Thai chili paste with fine beans, lime leaves, and Thai chili. Assorted seasonal vegetables stir-fried with our chef’s special sauce. Stir-fried vermicelli with onions, tomatoes, peppers, mushrooms, and egg. Stir-fried baby corn, spring onions, onions, carrot, and tofu with chef special sauce. Tofu and vegetable stir-fried in a sweet and sour sauce. Stir-fried mushrooms, onions, spring onions, carrot, and cashew nuts. Deep-fried aubergines in batter topped with our chef’s special sauce. Rice noodle stir-fried with our chef’s special sauce. Fried-rice with egg, curry powder, king prawn, pork, pineapple, cashew nuts, raisins, and spring onions. Fried-rice with egg, onions, spring onions, and tomatoes. Sice noodle stir-fried bean sprouts, peanuts, spring onions, and egg with tamarind sauce. Stir-fried thick rice noodle vegetables and egg with chef special sauce. Stir-fried thick rice noodle vegetables, fresh Thai herbs, and Thai chili. Sirloin steak, grilled Thai style with chef’s special sauce served on a hot plate. Crispy roasted duck topped with tamarind sauce. Chicken breast in batter topped with lemon and sweet chili sauce. Giant king prawn grilled marinated in garlic, ground white pepper, and butter. Deep-fried Seabass or Salmon topped with sweet and sour sauce cucumber, pineapple, onions, spring onions, and tomatoes. Crispy roasted duck topped with red curry, peppers, basil, and lime leaves. Steamed seabass or salmon with aromatic fresh ginger, lemon, garlic, coriander, and Thai chilies. Steamed King prawns with aromatic fresh ginger, garlic, coriander, and Thai chilies. Stir-fried spare ribs or chicken wings in black pepper sauce served on a hot plate. Stir-fried meat or vegetables with black pepper sauce served on a hot plate. Stir-fried galingale with pepper, onions, bamboo shoots, basil leaves, serve on a hot plate.